“There is an intellectual debate within the European Union, in which the prime minister is on the right side, even though these views are less popular. He thinks that the further expansion of civil liberties is not a good idea and he added that ‘we’ must reject Europe’s progressive direction,” writes Mandiner about Mr. Orbán’s speech. 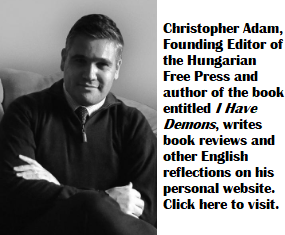 I should note that Mandiner has always been a more moderate (basically libertarian) conservative voice, even though its editors were all associated with Fidelitas, or with Fidesz in previous years. In recent months, however, its criticism of the Orbán government has become much more forceful. This might have something to do with a change in ownership around the site’s publisher. HVG uploaded a video of Mr. Orbán’s speech, as well as a brief article, and this too emphasizes the fact that the Hungarian prime minister believes that authoritarian regimes are proactive, while democratic ones are merely reactive. Mr. Orbán added that despite any “fumbling” on the part of the Fidesz government in Budapest, at least Hungary is not “adrift” like Europe seems to be, in his view. He suggested that the 28 members of the European Union have ceded (or, more precisely, pooled) too much of their sovereignty, and that some jurisdictions should be reclaimed by national governments. Mr. Orbán also believes that “progressive” Europeans see civil liberty as being able to question gender/sexual identities, national identities and “God’s creation.” Not surprisingly, Mr. Orbán finds all of this questioning totally unacceptable. “It’s better for us to honestly declare, that we don’t agree with this. There is no compomise,” added Mr. Orbán. This is where Mr. Orbán received a huge ovation from the Friends of Hungary crowd. Presumably, they are all deeply concerned by how the liberal West is forcing people to question their personal gender identities. “While Europe is debating, the East is at work. On our continent, debates are regarded more highly than labour,” said Mr. Orbán in his speech to the Friends of Hungary, building up yet again a false dichotomy between the “productive” east and the liberal western democracies that do nothing, but sit around and talk about ideas. Of course, we all know that Mr. Orbán has no respect for debate and dialogue, or opposing viewpoints. He has managed to run in two parliamentary elections without entering into a single debate with his political opponents. I can also count on five fingers how many times he has given interviews to any journalists who are not accomplished Fidesz party hacks through-and-through, over the past five years since his return to power. 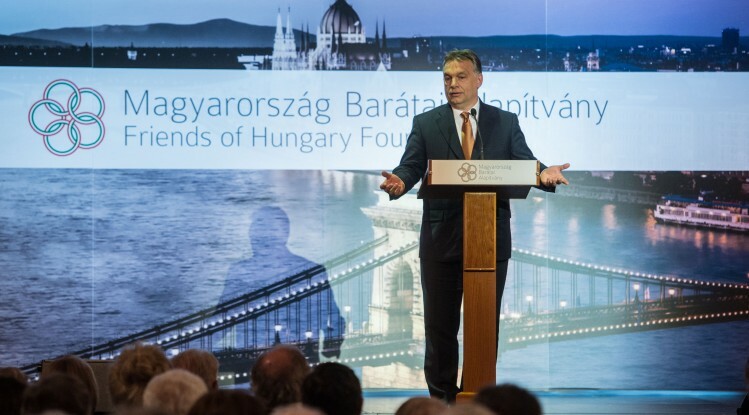 But since Mr. Orbán puts such a premium on work, the 150 members of the Friends of Hungary Foundation who attended this conference, and many of whom are active in diaspora communities, have been given their assignment, which is effectively to help quash any debate about the Orbán government in Hungarian communities abroad. Mr. Orbán’s speech at their conference was one example of the unbiased information that the Foundation provides to diaspora communities. He’s right. There is always need for debate in society, without debate you can’t find compromises or new solutions. But in the Europe, it seems debating is all we do. We actually don’t really debate anything either. The anto-social and greedy element of society has pushed their values and views onto society without much debate or respect for anyone else. The West has been at odds with it’s own culture and traditions since WW2, and every decade since then the odds and one sided debates have become more aggressive. Why is Europe waging a Culture War against itself? Why are values and morals that never had anything to do with Europe being accepted? The financial war in the world has been going on for some time. I think Orban is sensing the approaching collapse of the Western financial system and, as always, he is trying to fish in troubled water and finding the time ripe he is going for full blown dictatorship. Must be proud of his timing. Yet, what he doesn’t understand financial turmoil and the following social and political disturbances might result in different outcome what he is planning for himself. I expect a kind of war and many governments to be removed. It has been looming for at least five months. We will see whether Orban’s crime syndicate mafia government can survive it. It might be he just can’t find the emergency exit. He must be involved much deeper in this game than we can see from our chairs i.e. money laundering, arms trade, background financial settlements and mostly intel. It’s a one way street, these kind of organizations don’t tolerate their members taking it for a hotel, moving in moving out. No way out; I guess. Where’s the youthful, virile Fidesz apologist Szabolcs Nothin’ when you need him? Come out, come out, wherever you are! Let’s hear you defend Friends of Hungary! I think it’s time to get our terms right. The Friends of Hungary Society is a total misnomer. Please let’s get this right. It is the Friends of Orbán Society (FOS) we’re talking about here. (Note the letter S in Hungarian should be pronounced as SH, to wit: The group’s name phonetically is FOSH) Please reprogram your filing systems ladies and gents accordingly. Prof Harnad: isn’t a “brainwashed Carpathian basement” a mixed metaphore ? How about using “brainwashed Carpathian basement dwellers” instead ???? Which raises a question – where would you house members of the Order of Vitéz or the followers of the Szent Korona Tan ????? Under the FOSH or under the Carpathian basement dwellers ???? Not so easy, ey ???? Thomas: Why only two ? Why not three or four ? Is Orbán’s embrace of authoritarianism and his dismissal of discursive democracy a story ? Is it fiction or non-fiction ? Is the warm embrace by the eminent crowd of his no longer secret attachment to authoritarianism, a story or a fact ? How many sides does a fact have ? What I’m really interested to hear from you is this: should we call them FOS, FOSH or just LINK ? As you see, there are at least three sides to this story. Let it be stated for the record that I, as a rule, distrust all politicians as throughout history they have proven the famous Voltaire quote “It’s dangerous to be right when your government is wrong”. The most revolting government Hungary has had since Rakosi was the Gyurcsany farce of incompetent liars (self-admitted, which makes them look soooooo good) and while Orban certainly is far from prefect, the recent accusations of him being a dictator is patently ridiculous, a perfect example of legal left-wing, ex-communist journalists (who still lament the disappearance of the USSR) and who continue to prop up the failing EUSR (European Union of Soviet Republics), slicing and dicing his comments to fit into some slanderous material they can propagate. Orban the ‘brutal dictator’ introduces an Internet price hike of one dollar a month( what a monstrous rip-off that is!) and a subsequent people’s protest quashes the plan, as Orban stated “’the people have spoken”. Sounds like a real fascist to me! Then, there is the Putin affair, where Orban put Hungary’s interest before Europe’s (which is why the Hungarians elected him, BTW) and he gets slammed for not towing the Euro line. Really? Orban, pro-Russian? C,mon , is a fascist or a communist, make up your mind Brussels (Cohn-Bandit’s fiefdom). PRIME MINISTER VIKTOR ORBÁN’S SPEECH AT THE SECOND WORLD MEETING OF THE FRIENDS OF HUNGARY FOUNDATION : As for his alleged preference for autocracy, anti-Orban left wing journalists simply used the classic legal trick of OMITTING words to fit into their agenda (see bold section below) or OMIT that the initial statements was a question and not an affirmation. “For instance, how is it possible that while Europeans value democracy more than non-democratic systems – a view that we Hungarians share – the latter appear to be more successful these days? In the decades ahead will democracy be able to provide the good leadership we would like? And what is the reason that extreme political forces are continuously gaining in strength in our own world, within the European continent? To quote an analyst from the Brookings Institution: “Meanwhile, insofar as there is energy in the international system, it comes from the great-power autocracies […] it is still these autocracies […] that act while the democracies react”. The world today is about the fact that, while Europe is busy debating, the East is busy working. In Europe 65 out of 100 people work, in the United States 75 out of 100, while in China 85 people out of 100 work. One sometimes feels that on our continent debate is valued more highly than work – and if this remains so, Europe will fall behind”. I have desperately sought to find the faults that the left accuse him of and I have found nothing but clever chicanery from writers and commentators who manipulate their overt hatred for him into some kind of pseudo-fascist portrayal which is both false and libelous. Perhaps it’s this kind of cheap and low class ex-communist slander that still poisons the Central European climate into old ways and customs that has brought only misery to all of mankind. All politicians deserve being monitored as it’s the basis of democracy, challenged, debated but also disrespected? He is the leader of Hungary by popular vote (done without any hint of fraud), he has not banned other political parties, he has not torched the Parliament to justify one party rule, has not antagonized any Hungarian anywhere. Yes, he feels the EU is a hopeless case, what do you expect when you can’t get Hungarian milk in Hungary. This idiotic Soyuz-style economy did not work in 1919, in 1936, in 1956 or in 1989. Please let us remember that the USSR failed for inherent economic reasons and not political ones.